Tell us about yourself and your journey chasing your creative dreams. 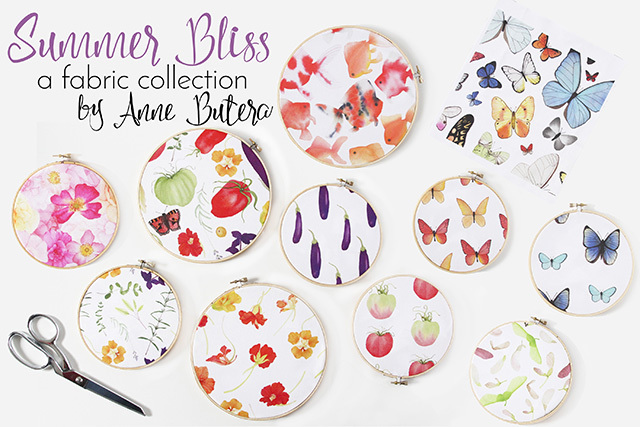 My name is Anne Butera and I am a blogger and self-taught botanical watercolor artist. I believe that art, creativity and gratitude are transformative and I’m passionate about encouraging others to embrace their creativity and discover their joy. A little over 6 years ago I hadn’t yet picked up a paintbrush. My job and the city where I was living left me constantly drained. I knew I had to do something and without much of a plan I quit my job and moved to the country to chase my dream of living a more creative and fulfilling life. I secretly wanted to be a painter and although I started teaching myself to paint, when I opened my first Etsy shop it was to sell sewn and crocheted jewelry and accessories. Things didn’t work out quite as I had hoped and that first step of my creative journey was a failure. I moved back to the city and tried to patch together my life. It was a dark and difficult time, but I held fiercely to my dreams and kept creating. That was five years ago. Five years of hard work. Five years of slow progress. Five years of clarifying my vision. Today I sell my art on my own website and on Etsy. I have a fabric collection available on Spoonflower. I teach classes on Skillshare. And I write a blog where the focus is art, magic and joy (a good overview of my blog can be found here). This past spring a project I collaborated on with blogging friend and fellow artist Dana Barbieri was featured in Uppercase Magazine. In June I had my first solo exhibition. And recently another dream came true when my blog was featured in the Winter 2017 issue of Artful Blogging magazine. I feel as if I’m finally getting closer to truly living my creative dreams. Something I didn’t fully understand when I was starting out is that success doesn’t happen overnight and that (for most) achieving your creative dreams is a long, slow process. My journey has not been easy. The road has been long and winding, challenging and sometimes scary, but my faith in the importance of creativity, art, gratitude and joy has kept me going. What are your favorite materials and supplies to work with? I am completely head over heels in love with watercolors. Over the years I’ve tried various media and techniques, but I always come back to watercolors. 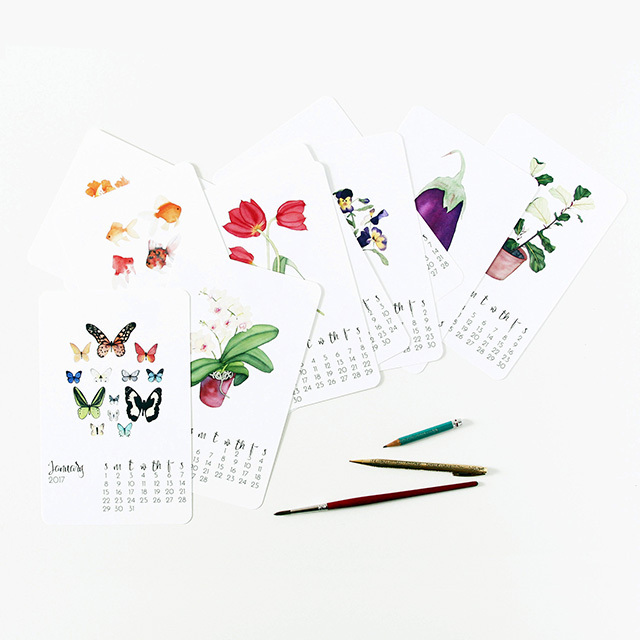 I think they are a perfect match for painting botanicals, giving a very organic feel to the finished pieces. I prefer working with pan watercolors and I use professional grade paints from three brands: Sennelier, Winsor & Newton and Yarka St. Petersburg. Until recently I primarily used Arches cold press paper and love the texture, durability and beauty of that paper. Lately I’ve also been trying a variety of hot press papers and am enjoying the change of working on super-smooth paper. It’s nice to shake things up every once in a while and I enjoy experimenting and trying new things. The sketchbook collaboration I worked on for over a year with Dana Barbieri helped me to stretch and experiment and one of the things I especially enjoyed trying was block printing. In my sketchbooks I like to use black Micron pens and keep things simple. 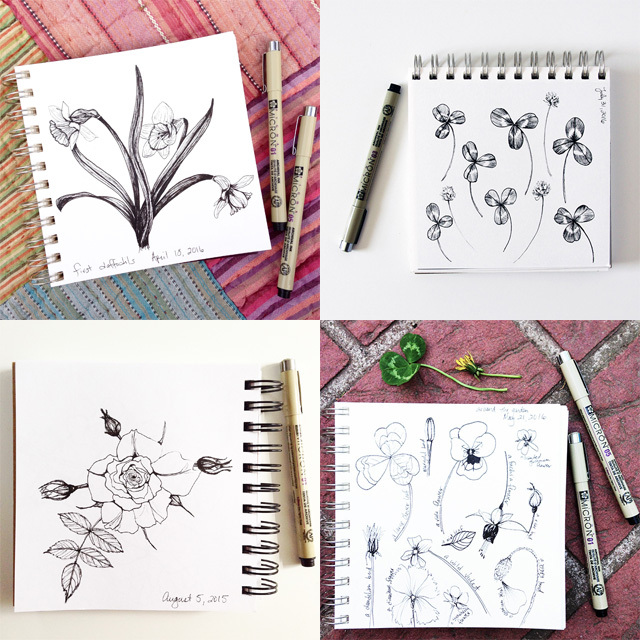 Sitting in the garden with my sketchbook and pens on a sunny summer day is such a joy. 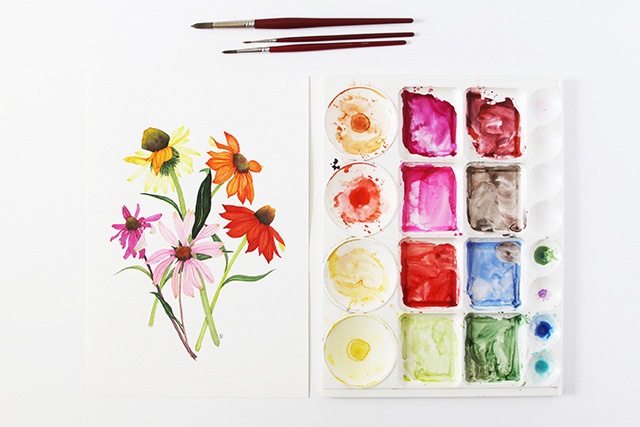 I also enjoy taking my watercolors into Photoshop, whether I’m simply preparing an image for my website or making prints from my paintings or working on my yearly art-print calendars or designing fabric. It’s so different from painting, but I find it very satisfying. How do you go about finding inspiration for your work? Inspiration is everywhere. I find most of mine in my garden. 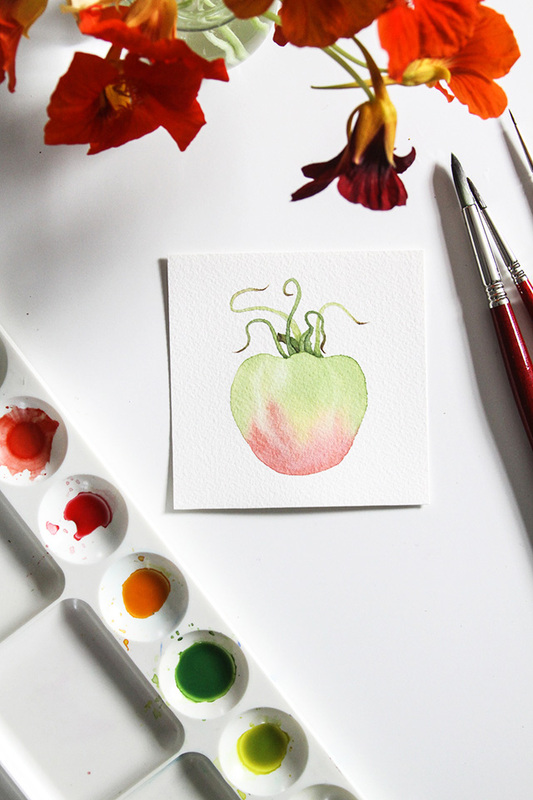 I like painting vegetables and herbs from the garden as well as flowers. 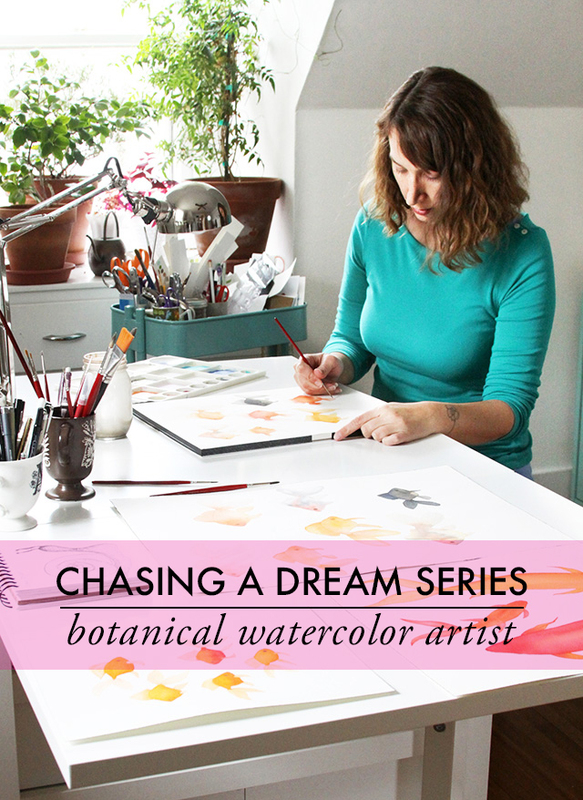 Having interesting subjects to paint is always a good justification for adding a new plant to my garden, too. Seeds, leaves and other bits I pick up on walks with my dogs also find their way into my paintings, as do butterflies (real, imagined and inspired by field guides) and goldfish. Because I live in Wisconsin where the winters are cold and long it’s then that my attention turns to my indoor garden. I have a large collection of indoor plants and they often work their way into my art. As long as I’m paying attention to the beauty and magic of the natural world, I’m never at a loss for inspiration. Can you tell us a little bit about your creative space? My creative space is always evolving. I’m fortunate to be able to use one of the bedrooms in our house as a studio. It’s a very bright space with two windows (which are both jammed with plants). I’ve painted the room white to give a clean backdrop for my work and to make the space brighter. I have two main work tables, one in the center of the room where I do my painting and one along the wall where I do things like trim my watercolor paper, prints and calendars (or fabric when I’m sewing). Recently I had my husband build tall legs for the table along the wall (which is actually a repurposed door) so I can stand up and work without hunching over. It also gives me more room underneath for storage. My computer has its own desk, a cabinet whose back creates an entryway into my studio. I’ve collaged the back of that cabinet with a patchwork of papers and it never fails to bring me joy as I enter my studio. I am most productive in the morning and my part-time job at the local library is a perfect fit because I don’t start there till the afternoon. Many days I spend some time blogging, whether it’s preparing a post for that day or for the future. Usually I spend some time each day responding to emails, networking and working with social media. Depending on where I am in a painting project I might be mixing paint, sketching or painting. Or I might be scanning a painting, cleaning it up in Photoshop, making prints or photographing my art or prints of my art. If I have orders to fill I’ll be packaging up art to send out. I might also be working on planning, filming or editing my latest Skillshare classes. Other days I’m updating my website, doing research or seeking out opportunities. I keep a running to-do list as part of my planner and adjust my schedule according to what special projects are going on. I try to regularly evaluate my way of working to make the most of each day. It’s always a challenge to balance everything. What are your goals for your creative business? I want to keep growing. Growing my skills and growing my business. I don’t yet make a fulltime living from my art, but I’m working on expanding my streams of income with that as a goal. Teaching has been a wonderful addition and it’s been so satisfying to be able to inspire people with my classes. I’d like to do more surface pattern design and license more of my art. I’d also like to do more commissions. Want to see more of Anne? Do you have a small business that you are proud of? Send me a little information about your story at alisaburkesubmissions@gmail.com for the opportunity to be featured in my "The Art of Chasing a Dream" series. I have learned so damn hard...I graduated humanistic collage and economic university...."this will give you good job and money! " -they were saying.It did...I'm 40 and 5 years ago I've quit.No more tears -I said.Art was always in my mind..But after 5 years of my experimenting with different art mediums I found out one thing.Complex.My mind is so blocked because I have never went to art school..And lack of real art lessons make my mind so ... poor....That is how I feel..That is why I am so afraid of starting my own creative business...Thank you for this post.I think I should focus on stories like this one.And keep practicing..No matter what.Thank you both, Girls. Wonderful interview! I loved learning Dana is a fellow Wisconsin artist! And I loved seeing such beautiful watercolor art. Thank you for sharing! Thanks for this intro to Dana! 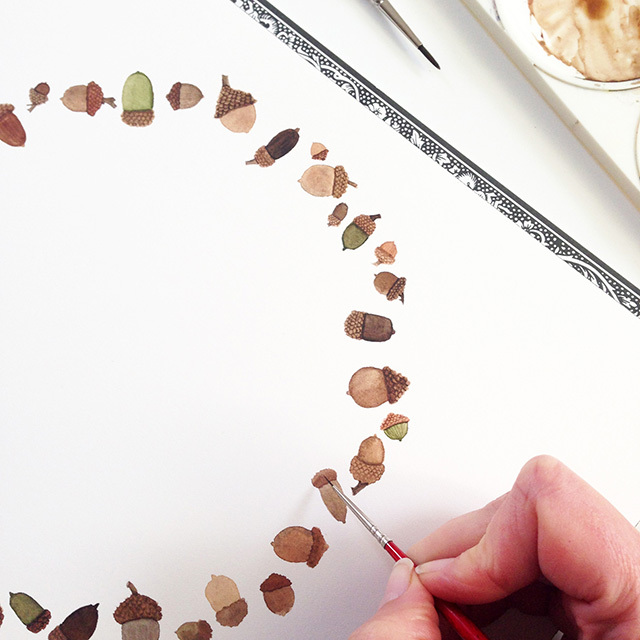 So good to learn of another new, fabulous artist (and she's s Wisconsin neighbor too!). 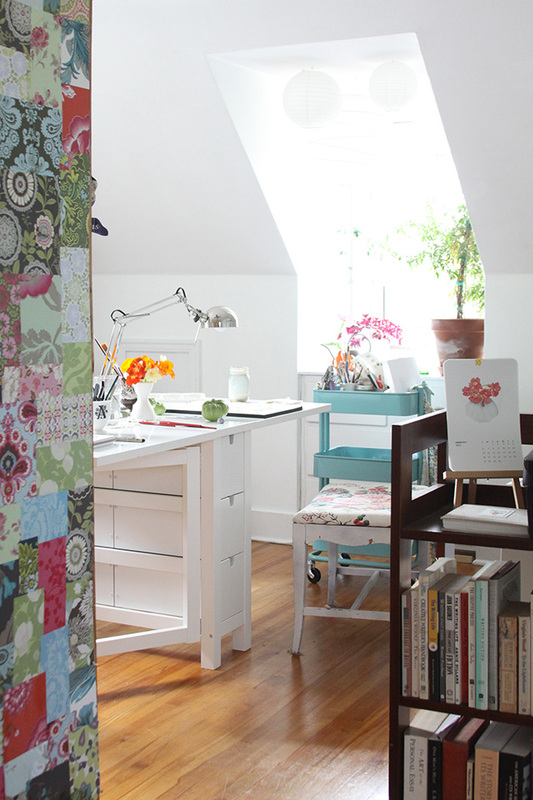 That patchwork cabinet is definitely swoon-worthy! Oh Wow! I went to your guest, Giant Strawberry Blog and her first fabric listed is so Gorgeous!! Spoonflower produced, artisan designed! 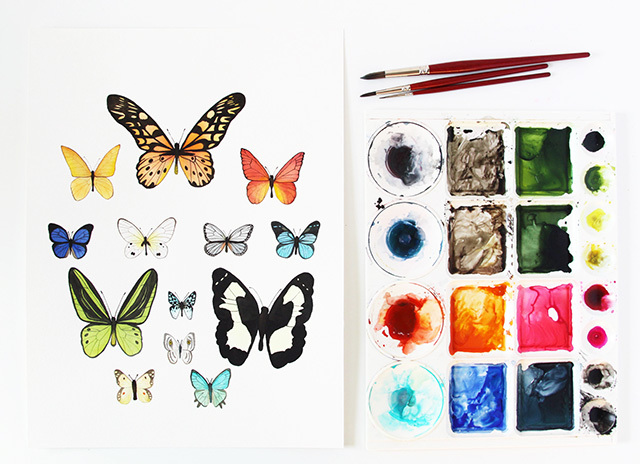 Those multiple colored butterflies are so Fabulous! radiant with color. Thanks for sharing, Alisa. Oooooh, thank you so much for this post! 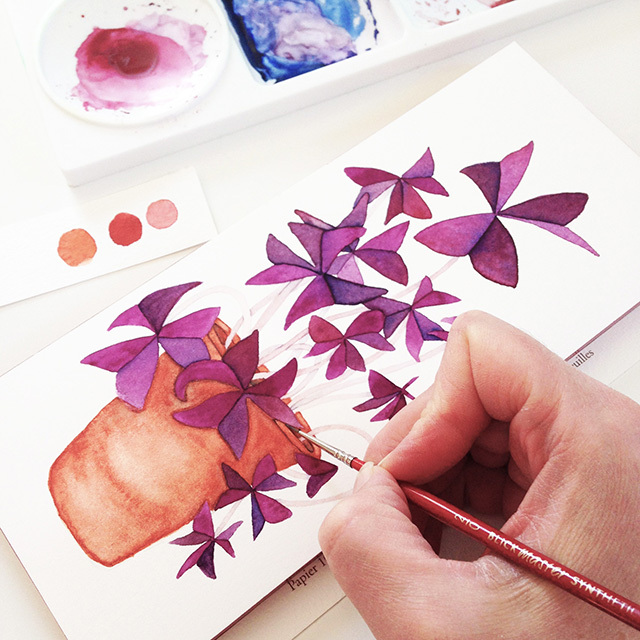 I love to do botanical drawings/paintings, even though I do them just.. ehm.. once or twice a year. Aehm. A wonderful interview - I've known Anne for years through her blog and emails, and she is a very talented and inspiring person. So nice to see her here, Alisa! i am so impressed to see it. Thank you, Alisa, for the feature and thanks to each of you for your kind comments about my work. I truly believe that we all can find ways to make our creative dreams come true. It will probably take a lot of hard work and a lot of time, but it's all worth it. Wishing each of you joy. black friday sale- three more days left! NEW class grateful heart journal GIVEAWAY! BIGGEST SALE OF THE YEAR this week! a free coloring page for you!